Cheese making played a major role in the economy and culture of Southwestern Dane County and the Driftless Area of Wisconsin. By the 1870's Wisconsin was second only to Illinois in wheat production but that changed rapidly and farm families looked for a way to stay on their hard-won farms. Milking more than just the family cow caught on in the Driftless area because the soils and topography made it a sensible move. But what to do with all the milk? The answer was cheese, a product that could be kept for months without refrigeration and that could be shipped long distances. Until the late 1800's, farm women were the cheese makers and production was done in the kitchen. The switch to a factory devoted to making cheese took many years. Stories of the success of New York cheese makers soon won over the locals and cheese factories started appearing throughout the area. Centrally located, always by water, often by the local school, cheese factories became the engine of rural life in southwestern Dane county. At the peak period in the early 1900's, there were more than 116 factories in the over 200 square miles of southwestern Dane county. 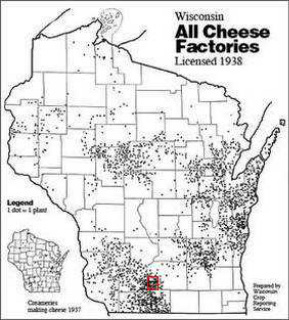 In the 1920's our area had the heaviest concentration of cheese factories anywhere in Wisconsin. But things change in farming just as in any industry. After World War II, fewer Americans chose to farm. Many remaining farmers started producing more valuable grade A milk. Both of these made it too difficult for local cheese factories to remain profitable. In the late 1960's, the last cheese factory closed. The distinctive factory style can still be seen along rural roads as the surviving buildings have become comfortable private homes. Click on the cheese factory name to see its page with pictures, description, maps, etc. 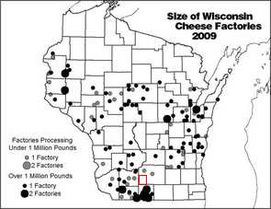 These factories were listed in the Biennial report of the Dairy and Food Commissioner of Wisconsin for various years but we could not find any other information on them. Any help would be greatly appreciated. If you have information, please contact us at mthorebarchives@mhtc.net. Amberger 1898, 1906 Mt. Horeb Associated with Spring Valley? Bangs 1898, 1901, 1903 Mt. Horeb Associated with Sharpes Corners? Barrey Dairy 1909 Belleville RD 1 Paddock, T.H. England, C. 1896, 1898, 1903 Primrose Associated with Rock Hill? Thos. Jones 1896 Springdale Mt. Vernon CF? Reeste, C.O. 1901 Blue Mounds Same as Ruste,C.O. and Rusk 1902? Assoc. with Barber CF; 1912 06N05ES30 W2SW4? Stucky Bros. 1898 Elvers, Vermont Also Fred Stuckey creamery 1900; Elvers PO could have served Iowa Co.
Wallen 1896, 1898, 1903 Primrose Stone Hill?